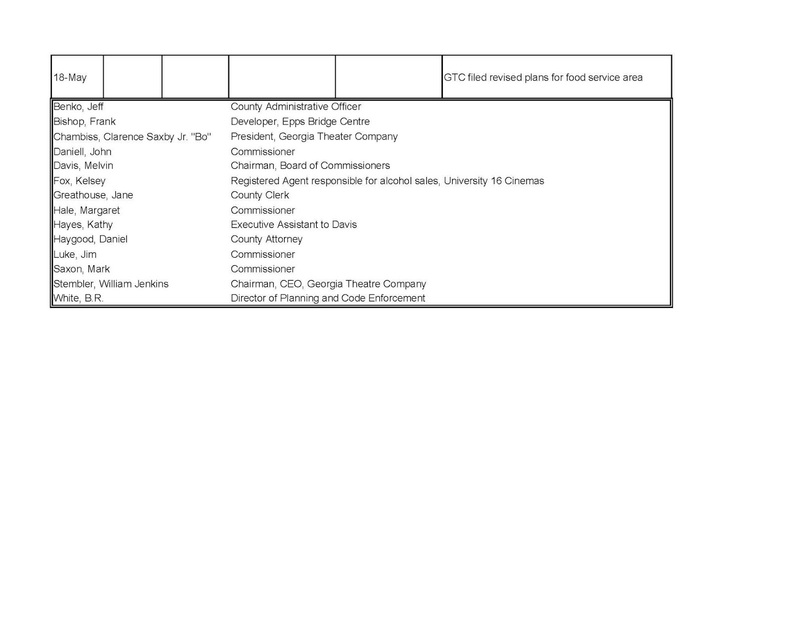 And it will be accommodating Frank Bishop, developer of Epps Bridge Centre, and Bo Chambliss, president of the Georgia Theatre Company of St. Simon Island and the son of U.S. Sen. Saxby Chambliss. The younger Chambliss is asking that the food service area, banquet room and auditorium 8 at the theater under construction in Epps Bridge Centre be classified as a restaurant as specified in the Oconee County Code of Ordinances and that he be allowed to sell beer and wine in these rooms. The BOC put off making a decision on Chambliss’ request at its May 7 meeting because the time lapse between completion of the application and time of decision did not meet the law. The Commission is scheduled to take action on the request at its agenda-setting session on Tuesday night. That meeting starts at 7 p.m in the courthouse in Watkinsville. The events leading up to the vote go back several months. On March 28, Chambliss sent an email message to County Administrative Officer Jeff Benko and County Attorney Daniel Haygood saying that he wanted “to try to find a way” to serve beer and wine in several auditoriums in the theater without seeking a change in the county ordinance restricting the sale of these beverages to restaurants. Auditorium 1 will be accessed directly from the restaurant space, Chambliss said. A server will take orders in the other two auditoriums and deliver food and beverages from the restaurant to patrons there, he added. County Attorney Haygood sent BOC Chairman Melvin Davis and Administrative Officer Benko an email message on the morning of April 12 rejecting Chambliss’ proposal. Haygood said he and B.R. White, director of planning and code enforcement for the county, had reviewed the proposal and concluded the county could issue Chambliss a beer and wine permit under the terms Chambliss' proposed only if the county made changes in its ordinance. “When the BOC amended the Beer and Wine Ordinance to allow the sale of beer and wine by the drink, it clearly intended for that to occur only at a restaurant as we all understand the term to mean,” Haygood wrote. “To allow GTC to serve wine and beer by the drink inside a theater is outside the contemplation of the BOC in its action,” Haygood continued. Haygood’s email set off a flurry of email responses, an open records request I filed with the county has revealed. Eight minutes after Haygood wrote, Davis responded and asked Haygood if he had shared his and White’s view with GTC and with Frank Bishop, developer of Epps Bridge Centre. “If this information has not been conveyed to the Theatre attorney’s and Mr. Bishop–I am assuming it will be done so,” Davis wrote. Haygood, who does not have his office in the courthouse, responded five minutes later that he had not yet communicated with GTC or Bishop. “As always, we are communicating with the County first before sending that information to the owners,” he wrote. Haygood sent an email to Chambliss, copied to Bishop, at 12:14 p.m. on April 12. “BR White and I have reviewed the proposal and both believe the service and sale of wine and beer in the theater rooms can only be allowed with an ordinance amendment,” he wrote. Haygood also advised Chambliss and Bishop that the county’s ordinance requires that 75 percent of the sales by the restaurant be for food, with 25 percent maximally allowed for alcohol. He said that the theater needed to find a way to separate out the cost of the food and alcohol from the theater tickets so that the restaurant will be in compliance with the food sales requirement. The ticket, in other words, could not substitute for or be included in the food charge. 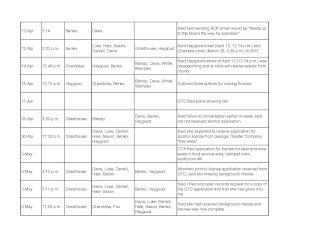 Developer Bishop sent BOC Chairman Davis an email message at 4:46 p.m. on April 12, a Friday, asking if he could meet with Davis on the following Monday morning. Davis’ assistant, Kathy Hayes, wrote to Davis at 5:09 p.m. saying she had talked with Bishop and arranged the appointment. Chambliss didn’t write back until 12:49 p.m. on Sunday, April 14, but his message was very direct. “This is disappointing,” Chambliss said in his message to Haygood and Benko, copied to Davis, Bishop, White and William Stembler, chairman and CEO of GTC. 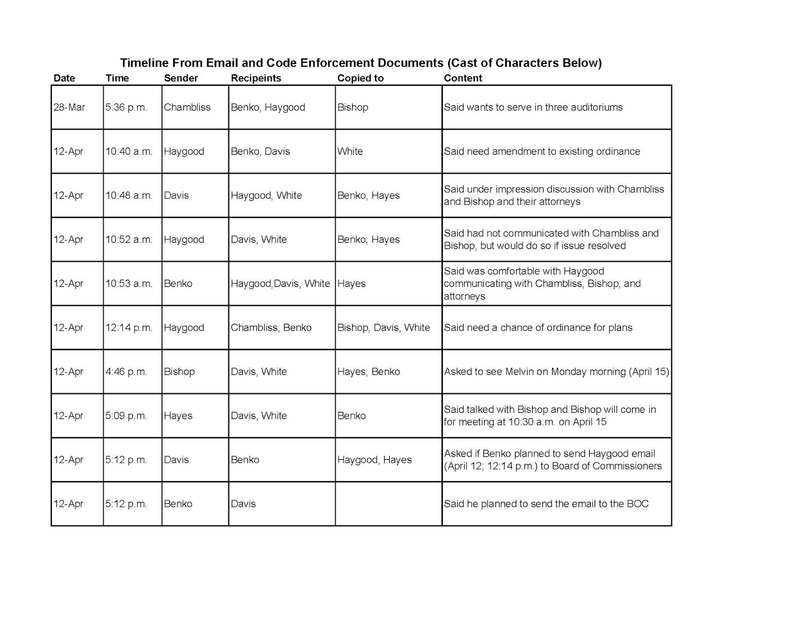 County Attorney Haygood wrote back to Chambliss, copying Bishop, Davis, White and Stembler, at 10:10 a.m. on Monday, April 15, offering him three options. Option two would be for Chambliss to submit an application for a stand-alone restaurant only. The third option, Haygood said, would be for Chambliss to seek a change in the ordinance. The restaurant has to accommodate a minimum of 50 patrons, and 75 percent of its gross income has to come from the sales of meals or appetizers. The ordinance says only four types of restaurants in the county can sell beer and wine. The first is called a Custom Service Restaurant where food and drink “are prepared to individual order, ordered and served at a table, and consumed primarily within the principal building or in established outdoor dining areas.” This cannot be a fast food restaurant, according to the code. The second type is called a Family Restaurant, which is a Custom Service Restaurant that also allows take out service but no drive-in or drive-through service. These, the law stipulates, are usually chain restaurants. The fourth type allowed is a Rooming or Boarding House. This is a dwelling in which a family or manager offers lodging and meals. This is not, the law states, a Bed and Breakfast Inn or a Hotel or Motel. 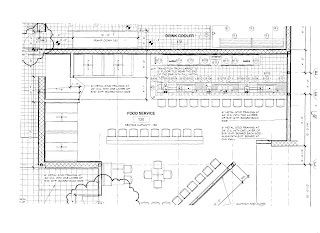 When GTC submitted plans to the Oconee County Code Enforcement Office for the theater on April 17, just after Haygood had presented his options to Chambliss, it listed the area near auditorium 8 as a bar. Next to it was a banquet room, and behind the bar was auditorium 8. 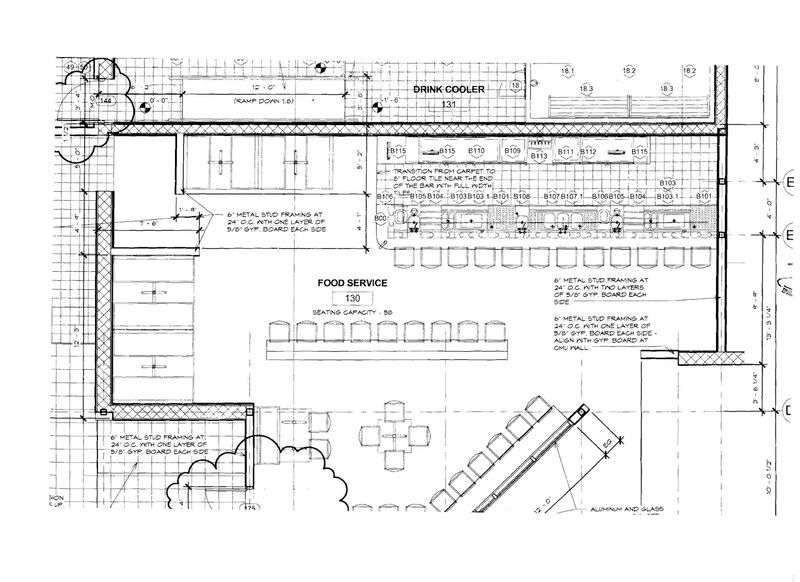 In an attachment to the beer and wine license application submitted to the BOC on May 3, the area previously designated as a bar was designated as a food service area. The request was to sell beer and wine in the food service area, the banquet room next to it, and auditorium 8, also near the restaurant. In plans submitted to the Code Enforcement Office on May 18, the area was designated as food service. 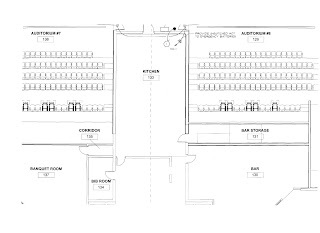 It states that seating capacity is for 58 persons and shows a bar with 12 seats running across the back wall. The May 3 license application states that the banquet room will seat 118 and the auditorium 137. It also states that the restaurant will seat 58. At the end of the day on April 12, Davis asked Benko if he felt it was appropriate to inform the four voting member of the Board of Commissioners of Haygood’s message of early that day and of the discussions regarding the theater beer and wine request. Davis is a member of the Commission but votes only in case of a tie among the other four members. Benko said he was a good time to do that. “It’s a heads up to the Board the way he operates!” Benko wrote. He forwarded the message that attorney Haygood had sent to Chambliss earlier that day as well as Chambliss’ March 28 email. 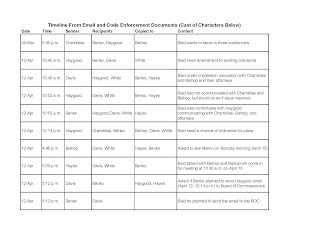 Benko sent the Board nothing from Bishop, according to the email record. 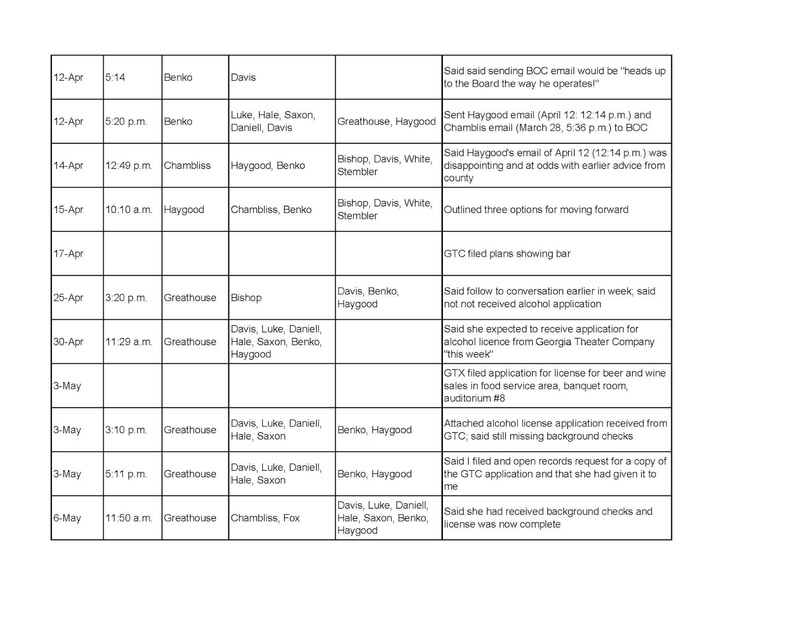 County Clerk Jane Greathouse sent an email message to Bishop on the afternoon of April 15 indicating that she was following up on a conversation earlier in the week about the beer and wine application from Georgia Theatre Company. “As of today, we have not received the application,” she wrote. She said she also had discussed the application requirements with Bishop on April 15, the day he met with Davis following the message from Haygood. Greathouse sent the completed application to the four voting BOC members at 3:10 p.m. on Friday, May 3, in anticipation of the Commission meeting May 7, the following Tuesday. At 5:11 on May 3, Greathouse sent the commissioners another message indicating I had obtained a copy of the application earlier that afternoon via an open records request. On Haygood’s advice, the commissioners took no action at the May 7 meeting because of the lateness of the application. I filed a second open records request on May 9. 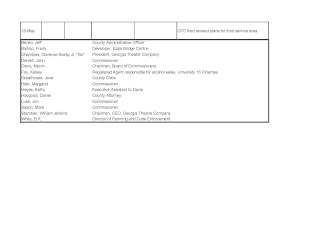 I asked for all correspondence since Jan. 1, 2013, between GTC Epps Bridge LLC, the legal entity for the theater, or any of its representatives, including Frank Bishop, and Davis, Benko, White or Haygood involving the application for malt beverages or wine sales at University 16 Stadium Theatre. I received 30 pages of email correspondence. I did not correct grammatical or other errors in the quotes used here. I used the name University 16 Stadium Theatre in my open records request, and that is the name of the theater, according to the documents in the county’s Planning Department and Code Enforcement Office. Georgia Theater Company has a web site for the Oconee County theater that uses the name University 16 Cinemas, and that is the name that is being placed on signage at the mall, according to Russ Henson, who is handling the plans for the Code Enforcement Office. Henson told me on Friday that work on the theater is progressing, and he said he expects the theater will be open early in June. All that the theater needs from the county to open is an occupancy permit, he said. GTC cannot sell beer and wine in the restaurant without the alcohol license. According to the GTC web site, the company is running a contest to determine the name of the restaurant inside the theater. The picture presented of the restaurant on the web site shows wine glasses and a silver fork at a table with a white tablecloth. The menu items, according to the application submitted to the county, are more mundane. Listed are Philly cheesesteaks, cheeseburgers, quesadillas, pizzas, salads, potato skins, chicken wings, onion rings and tortilla chips. The theater kitchen will operate from noon to 10 p.m., and the theater itself will operate from noon to midnight, according to the beer and wine application. The issue of theaters selling beer, wine and other alcoholic drinks is a common one around the country, a search I did of the words “theater beer and wine” on the Internet shows. 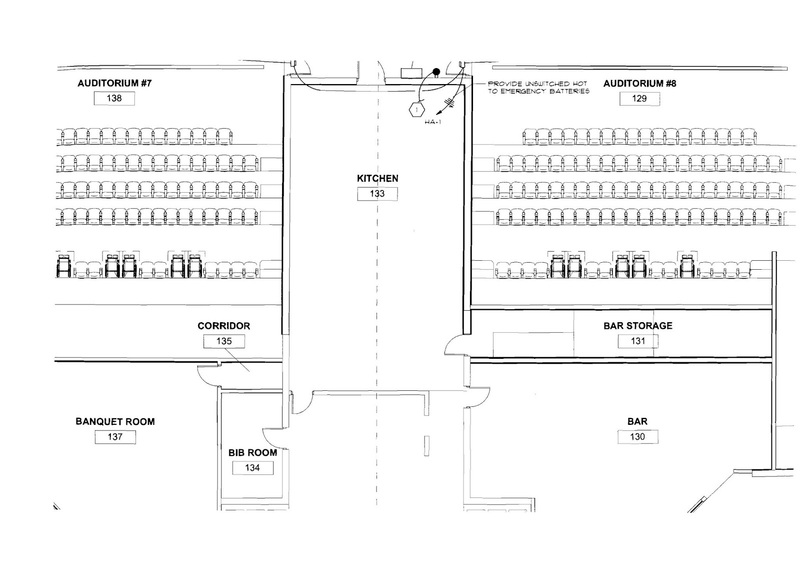 A GTC theater in Brunswick has proposed adding beer and wine to its offerings, an article I obtained through my open records request of the county correspondence indicates. I checked the minutes of Brunswick council meetings and found no record that the license had been issued. According to the beer and wine application submitted by GTC to Oconee County, GTC officials Chambliss and Stembler hold only one alcohol license at present. The pair owns MM Pooler LLC, according to the application, and that entity holds a license in Pooler, just west of Savannah, for its Mellow Mushroom Pizza Bakers restaurant. Clearly this is a bar and popcorn. It will be interesting to see what the Board does. Will the bigwigs win?